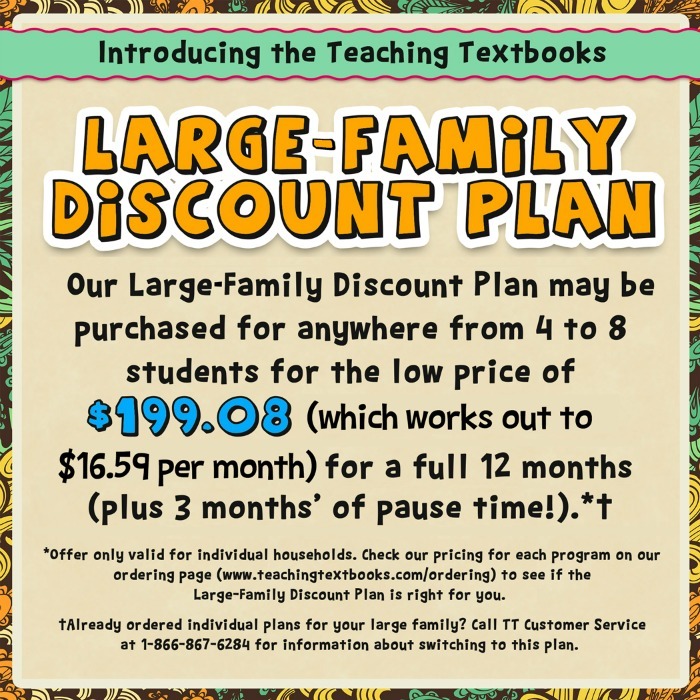 When we were recently given the opportunity to review Teaching Textbooks 3.0 homeschool math curriculum and offer you all the chance to win your own subscription, I couldn't pass it up. Be sure to enter the giveaway at the end of this post! I was compensated for my time preparing this review. All opinions are my own. Up until now, math has notoriously been the most difficult subject to cover with both of my boys. Most of our bad days could be easily traced back to a math lesson gone wrong. We finally found a homeschool math curriculum what we love! Math has never been a picnic. We used the same homeschool math curriculum from day one with my youngest. Boring, I know. Even though it was a battle, I stuck it out, because some kids just don't like math, right? Why switch? At least that's what I told myself until last year when I couldn't take any more math battles and decided to try Teaching Textbooks on the recommendation of a few friends. I found a great deal on a used set, and voila! My life was easier. It took me ten minutes into the first lesson to be glad I had made the switch! When we started using Teaching Textbooks, math was immediately a pleasant experience for my son, and therefore me. After one lesson, we were hooked. Engaging and easy to understand. I needed something that would keep his attention. I think the combination of the use of technology and the engaging nature of the program itself was a win for my easily distracted student. Bright and colorful. This was a huge plus compared to the black and white textbook pages we were used to using. There's even a selection of "buddies" your child can choose from like a cat, dog, or chameleon that hang out at the top of the navigation menu. Interactive. You can click around a bit while working which is great for kids who fidget. The "buddies" will give helpful tips and hints for the math problems. You can easily rewind, fast forward, or pause. It is very user-friendly! For me, it was a no-brainer! It's not only been a huge plus for my son, but I love the parent perks as well. Promotes independence. My son no longer needs me during math. Maybe he'll get stuck here and there, but for the most part, he works through the lessons on his own. Self-grading. I repeat. SELF-GRADING. Need I say more? Not only is my son working more independently in math then he has ever before, but I'm able to stay on track with his lessons completion and comprehension just by looking at his grade book. Self-paced and flexible. For anyone wanting to make a switch or try something new, but fear of change keeps you taking the leap, switching to TT was so easy! And when summer break came last year, we just stopped and picked right back up where we left off in the fall. There wasn't that dreaded period of warming back up to math. My son just logged on and started the next lesson. This type of math independence has literally never happened at the beginning of a school year before. Winning! Teaching Textbooks 3.0 has all of the benefits I already loved plus a whole bunch more goodness. Before Teaching Textbooks 3.0 we were using CDs. This was a pain because my son's laptop doesn't have a CD drive, so he'd have to use a USB connected drive. First world problem? Yes. But it is a pain to hassle with the CD drive and have cords hanging off the side of his laptop. No More CDs! Everything is online. He just logs in and that's that! Mobile Friendly. He can work from his phone or laptop. Online Textbook. NO more fussing with the bulky textbook. Customizable wallpapers and new buddies! These fun additions make a big difference. Not sure where to place your kiddos? TT is not grade-level specific, so it's important to have your child take these FREE online placement tests to see which TT level to start. For example, my son is technically in 8th grade, but because we switched our math curriculum mid-year last school year, he's still working through the end of Math 7. 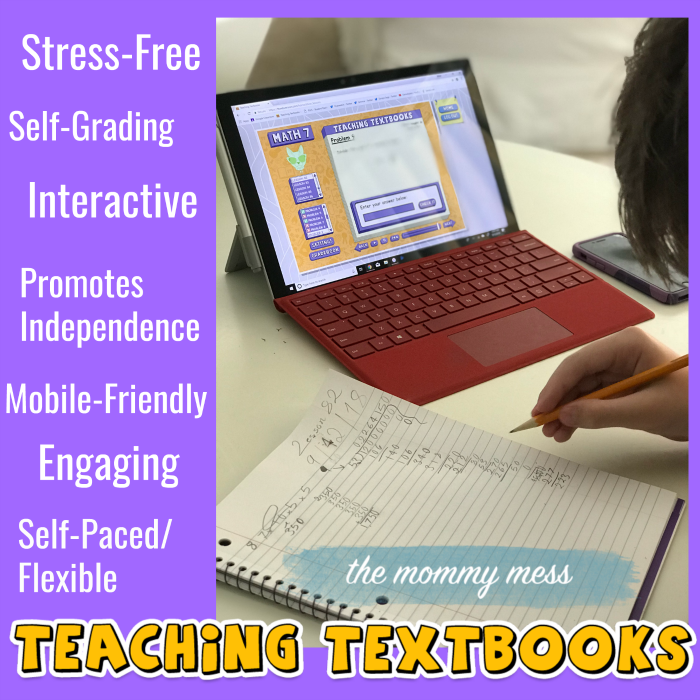 Are you looking for a stress-free homeschool math curriculum? Enter to win a subscription level of your choice!